A failure can ruin your month. It’s repercussions can last and last. It can introduce doubt and personal anxiety. It can make a patient’s name on the day list increase your heart rate and dread their arrival. Why did that endo fail? Am I the only one who this happens to? Everyone else just seems to get their dentistry to work but my patients complain. Who will the patient tell? What on earth do I do next? If I ask for help does that mean I admit I’m weak? Sadly, we tend to forget our successes. Most readers will look back on the average week and forget the happy patients, the smiling faces, the gratitude expressed by the many, as our memories are shadowed by a dark cloud, a gnawing sense of dread at that one anterior composite that fell off after just a week. The patient’s answerphone message left in angered tones and with urgent need. The rebooking to try again, when in your heart of hearts you know this second attempt will have no procedural differences from the first; so if it works this time…it’s luck. All too well I remember waiting for the x-ray developer machine to spit out the post-operative endodontic periapical film. A silent slither of judgement on me as a professional. If by luck it happened to look good I could admire it for a good ten minutes, especially if someone happened to be nearby and happened to take an observant interest. If the result was not so good… well, often the machine would get blocked up and ‘a failure to develop properly meant the exhibit was best disposed of’. 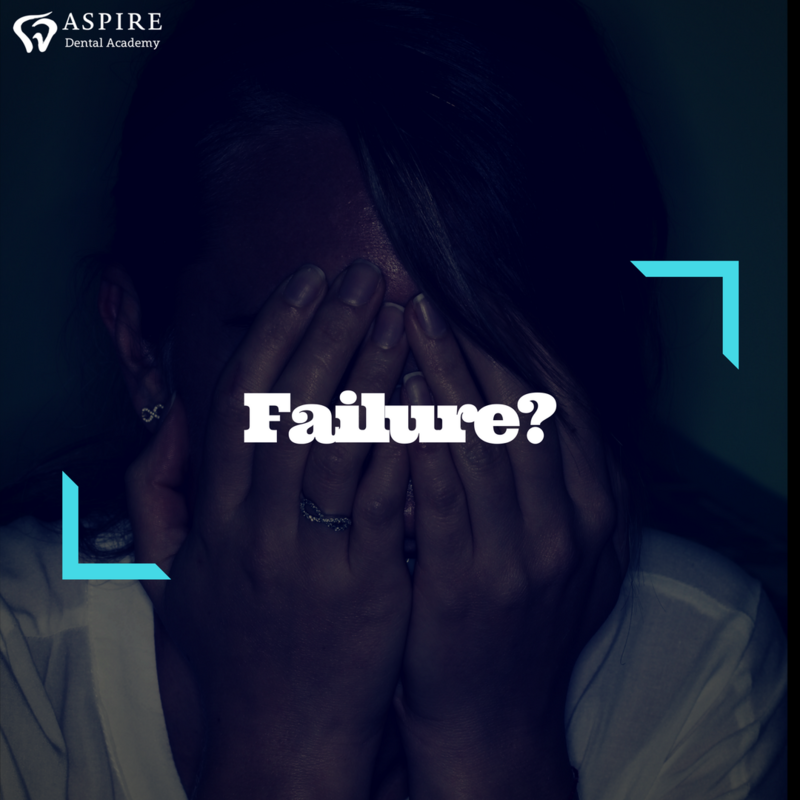 The fear of failure grabs most of us even at the undergraduate stage. These doubts are unsettling and if numerous or frequent enough can engender doubts about our suitability for ones career. The truth, though, is more complex. Those doubts are an asset. Those doubts show you care. Those doubts show a good outcome for your patient is important to you. You, dear reader, are someone I can work with and trust. We are not superhuman and we will make mistakes. We then have to live with those mistakes and learn from them. Otherwise, working in any field of healthcare will eventually break us down. You can use those doubts to steer you, to drive you and make you aspire to a day when failure is all but eliminated. Perhaps a good starting point is to acknowledge the limited lifespan of any dental work. The difference between the expected and actual lifespan of a treatment can lead to it being perceived as a failure – whether by us or by our patients. I remember qualifying from a prestigious London dental school and being told I am ‘the best of the best’. Six months later, in a poorly lit and poorly equipped dental vocational trainees’ surgery, as I vainly failed to stab a file into a seemingly invisible and certainly impenetrable mesio-buccal canal in a lower right six, I began to doubt the voice that had so confidently assured me of my credentials! If I was the best, then crikey, we are in a poor state indeed. Four days later, the patient, an international athlete, had to withdraw from a major European competition to seek urgent medical help in The John Radcliffe Hospital for a spreading sub-mandibular infection requiring IV antibiotics and drainage. Nevertheless, after hospitalising this patient, I was going to do all I could to become as good as I could be. In her extraordinary book, Dr Carol Dweck calls this a Growth Mindset. Along your professional path, you will meet clinicians who share this philosophy. Spend time with them, grow together and the challenges you will inevitably meet are just waiting to be overcome! You will also meet others of a more fixed mindset. All fixed, all negative, all wrong. Patients’ perceptions of failure are best managed long before the treatment occurs. Imagine the situation whereby you try to restore a broken-down premolar with just a slither of buccal cusp remaining and little else. The patient dislikes rubber dam, struggles to co-operate and your 3-in-1 leaks water when it should be just blowing air. Your attempt at a composite falls off two days after you cured it (and two days after the patient parted with a pile of cash they had notched up to spend elsewhere). What does the patient then think? Did they know they weren’t giving you enough cooperation to treat them at the optimal level? Did they understand that licking the etched enamel whilst you looked away would render your efforts useless? Do they know that your back hasn’t stopped hurting because they refuse to sit back in the chair? Do they know or care it was doomed to failure before you started and you only did it because you truly wanted to help them as they can’t afford more invasive treatment? No, so they think ‘bad dentist’. And there’s not only this to deal with but also the fact that the breeding ground for complaint has become much more fertile. This tooth is extremely broken down so attempts to fix it are extremely ambitious and I really can’t offer you any meaningful guarantees of success. It is essential to keep the tooth dry so I will need to sit the chair flat (Don’t worry, we won’t let you fall off) and use this amazing device called a rubber dam so we can be sure we have done all we can to improve such a bad situation. The last thing I want is for you to waste any time or money on a hopeless cause so think very carefully if you want to try and throw ‘the kitchen sink’ at this. I know you are keen on this treatment but if you were my little sister I would tell you bluntly it is a waste of your time… and I love my little sister very much. Showing empathy at the dire state of the tooth before even making a plan goes an awful long way too. These warnings can diffuse a complaint bomb before it is even made. To under-promise but over-deliver has never been so crucial as in today’s climate (of blame culture and litigation). Repeat failures hurt more than any other. That pesky adhesive bridge just keeps coming off…aaaaaghh! This can feel like an endless cycle of misery and frustration, and even more so if we run out of options. Well, here’s the thing. Dentistry works. The technical side of dentistry, I mean. Really truly, it works. Well, at least sensible dentistry works. It really does. Certain designs of adhesive bridge have some of the best success rates in the world1. Despite that, I recently heard a speaker at a large conference glibly dismissing that as a treatment option for a missing anterior tooth, as if anyone considering this would be absurd and not worthy of debate. He made it clear an implant was the only answer despite global statistics estimating that after ten years one in four implants can be considered failing or failed. … the list goes on and on. Experience, however, makes it easier to detect those patients and situational factors that ‘raise a red flag’. It doesn’t mean that severely parafunctional patients should be refused treatment. Far from it, as they may need it the most; but it does mean they need to understand exactly what they are capable of doing to their enamel, let alone your composite2!! Once we have assessed the risk we can concentrate on the last bullet point. Us. Ideally we should do the ‘right’ treatment, do it once and get it right. A national programme by the NHS is pioneering this now. GIRFT (Getting It Right First Time) is gathering momentum and attention and is a sensible philosophy to adopt. It doesn’t make us immune to failure (or at least the perception of failure) but it means we did the most sensible treatment we could and did it as well as we could. Now that seems like a good idea to me. Combine that with a growth mindset and a commitment to learning and we may even find ourselves enjoying work and earning the trust and respect from patients we so desire. If we have a failure we should be open about it. There are only two possible outcomes. Either we learn the reason why and thus ensure we won’t repeat the cause or we learn that failure was inevitable. The latter offers reassurance that we didn’t do wrong, we just couldn’t do right in the first place and now we understand why. Both outcomes make us better. Perhaps we should end on what to do when we see others posting photos of their ‘successes’ with overly destructive or poor quality work that we ourselves would consider failure or even harmful. The ‘daughter test’ is a very sensitive one here3. First of all, be sure you have the full and complete story. Too many of our colleagues seem trigger happy to deride and criticise without knowing anything at all about how the treatment decisions were made. Perhaps the time has come for us to reach out and offer help, to seek help ourselves, to link arms and learn together. We must never allow patients to come to harm and the GDC rightly encourage whistleblowing if a patient may come to harm. But let’s not allow it to get to that point. Let’s highlight and analyse failure, let’s learn from it. We can be honest with our patients about it, remedy it and confine first failures to the history books and never repeat them. Let’s GIRFT together and feel better. Survival characteristics of 771 resin-retained bridges provided at a UK dental teaching hospital. Demolition Experts: Management of the Parafunctional Patient: 1. Diagnosis and Prevention. Ethical issues, dilemmas and controversies in ‘cosmetic’ or aesthetic dentistry. A personal opinion. Copyright © Aspire Dental Academy. All rights reserved.